NY NJ Strong (TM) NYNJStrong.com NEWS – Our deepest condolences to the survivors, families, and people of New York New Jersey recovering from Man-Made and Natural Disasters. Thank You First Responders, Hospitals, and All NY NJ Strong Participants. FORWARD MOVING & FLYING ~ SPIRIT ~ NEWS MEDIA. Made in the USA. (C) 2012, 2013, 2014, 2015, 2016, 2017, 2018. All Rights Reserved. Jersey City, NJ 9/11/2015: Jersey City’s Riverfront 911 Tribute displays a twisted steel beam draped with an American flag. The New York skyline stands tall with the Freedom Tower and beams of light representing the World Trade Center Twin Towers glowing in the evening skyline. Photograph by Stanley Brick (C)2015. 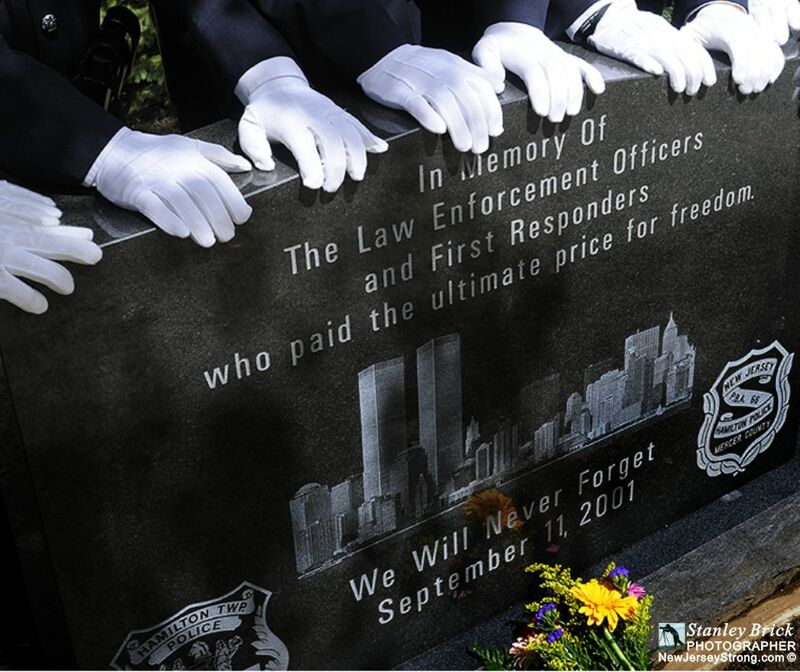 Hamilton, NJ 9/11/2015: Hamilton Police monument to fallen first responders at Veterans Park 9/11 Memorial. Photograph by Stanley Brick (C)2015. 2,752 men, women and children were killed on September 11, 2001 in the second terrorist attack on the World Trade Center. 6:00 a.m. Polls open in New York City for primary elections. 7:59 a.m. American Airlines Flight 11 takes off from Boston’s Logan International Airport for Los Angeles. 8:00 a.m. New York City public schools open for the fourth day of the new school year. 8:14 a.m. United Airlines Flight 175 takes off from Boston’s Logan International Airport for Los Angeles. 8:20 a.m. American Airlines Flight 77 takes off from Washington, DC’s Dulles International Airport for Los Angeles. 8:42 a.m. United Airlines Flight 93 departs 42 minutes late from Newark International Airport for San Francisco. 8:46 a.m. After receiving a call from the Federal Aviation Administration’s Boston control center that Flight 11 has been hijacked, the Northeast Air Defense Sector (NEADS) scrambles two military jets to the New York area from Otis Air National Guard Base, Cape Cod. 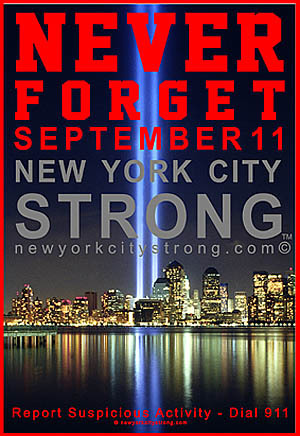 8:46 a.m. Hijackers crash American Airlines Flight 11 into floors 94 to 98 of 1 World Trade Center, the North Tower. 9:00 a.m. FDNY, the New York Police Department (NYPD) and the Port Authority Police Department (PAPD) are at their highest mobilization levels. Port Authority civilian staff and all on-duty WTC response staff have mobilized. 9:03 a.m. Hijackers crash United Airlines Flight 175 into floors 78 to 84 of 2 World Trade Center, the South Tower. 9:15 a.m. Officials begin closing New York City bridges and tunnels to all but emergency vehicles and pedestrians. 9:25 a.m. The Federal Aviation Administration orders the first-ever nationwide ground-stop, prohibiting the take-off of flights. Northeast Air Defense Sector (NEADS) jets establish combat air patrol over Manhattan. 9:30 a.m. The New York Stock Exchange does not open at its scheduled time; its employees evacuate. 9:37 a.m. Hijackers crash American Airlines Flight 77 into the Pentagon. 9:40 a.m. The Federal Aviation Administration orders all 4,546 planes in North American airspace to land at the nearest airport. By 9:45 a.m. Evacuations are under way at the United States Capitol, the White House, the Empire State Building, the United Nations, the Kennedy Space Center, Disney World and major sites across the United States. 9:59 a.m. 2 WTC, the South Tower, collapses in 9 seconds. 10:03 a.m. Hijackers crash United Airlines Flight 93 in a field in Shanksville, Pennsylvania, after passengers launch a counterattack to seize control of the aircraft. 10:28 a.m. 1 WTC, the North Tower, collapses in 11 seconds. All 16 acres of the World Trade Center site are in ruins. A rescue and recovery effort begins immediately at the WTC Site. 10:30 a.m. New York Governor George E. Pataki declares a state of emergency in New York State. 1:27 p.m. A state of emergency is declared in Washington, DC. 5:20 p.m. 7 World Trade Center collapses.